Goryaev V.M., Selyakova S.M., Gorbachev D.E. The article describes the characteristics of the oxygen sensor of oxygen are examined in detail with special emphasis on the behavior of oxygen sensor in the control system of incinerator with self-monitoring exhaust. Exhaust control makes it possible to lock the gasification chamber, which is especially important while disposing of highly dangerous waste, such as infected. This feature is especially useful in certain special facilities. Abandoning the controlling according to temperature provides additional advantages when burning in the gasification chamber. Forced draft does not allow a specific crust on the surface of decomposing waste to appear which, in turn, eliminates dangerous and unsafe necessity of turning the waste during the incineration process. Oxygen sensor, mounted in the exhaust system, automatically perform early diagnosis of equipment in order to avoid abnormal exploitation. Nowadays, the most effective method of eliminating waste is incineration. Incineration of waste generates incombustible ash content and exhaust gases which are emitted into the atmosphere. Physicochemical properties of the exhaust gases are strongly dependent upon the design features of the equipment and the control method. Equipment for incineration is called incinerator, the room or the area where they are installed called crematorium. Incinerator is a special oven, where the incineration process takes place managed by controlling and automation devices. Speed and the incineration efficiency depend to a great extent upon the number of monitored parameters and the adjustment. Incomplete incineration or incineration of specific waste may result in partial emission of hazardous substances to the exhaust gases. The hazardous substances concentration is a critical parameter and must not exceed the allowed value. Most of the modern small and medium incinerators are not equipped with any automatics, capable to control the incineration in terms of the amount of oxygen. It is believed that such an upgrade makes the equipment more complicated and, consequently, more expensive. Therefore, the regulation of processes is to maintain specific temperature in the various areas. With regard to equipment, that disposes homogeneous waste, this is quite enough according to numerous tests and laws of different countries. It is considered that, to ensure the necessary gas cleaning it is needed to equip incinerator with filters and absorbers, the value of which exceeds the price of incinerator. In this case, the more types of waste incinerated, the more expensive gas cleaning system is. Let’s consider the traditional automation scheme of work in the incinerator. See Figure 1. Controller «3» turns off the heater «4» when the temperature in the chamber «1» reaches a predetermined value and turns it on, if the temperature decreased to predetermined value. The fan «5» delivers air continuously, providing oxygen for incineration process. “Oxygen sensor” (OS) or “lambda sensor” (λ-sensor) is well known in engineering . These devices are widely used in the car industry. They can help to estimate the efficiency of incineration. Car OS has the best sensitivity in the range that ensures the presence of oxygen in the exhaust at the level of 6%, which corresponds to the most favorable conditions for fuel incineration. Due to the fact that the OS determines the presence of oxygen, the type of combustible fuel does not matter. An important parameter that means the redundancy of oxygen is its presence. The fact of excess of oxygen in the exhaust gas at a temperature of 800 ° C or more, confirms that the oxidation process was completed . Fig.2. 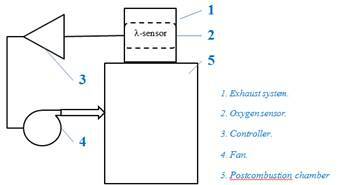 Diagram of operation of the oxygen sensor. Levels of the signal. Using the principle of measuring of the residual oxygen, our incinerator was designed with a controlled supply of air (forced draft). The figure 3 shows the scheme of forced draft control. According to a signal from the oxygen sensor «2», controller «3» manages the work of a fan «4». If the exhaust gas contains more than 6% of the oxygen the forced draft decreases, otherwise the amount of provided air increases. Thus occurs the regulation of complete incineraton. Tests have shown that for full and safe incineration, the temperature values are of secondary importance. The heater can be switched on permanently, and incineration efficiency is provided by oxygen control system. Experiments showed that the system equipped with the control of oxygen, execute incineration with greater speed and efficiency. In the study of the composition of the exhaust gases wasn’t detected the traces of carbon monoxide, soot, dioxin, and other "unburned" organic compounds. The amount of nitrogen oxides (NOx) is vanishingly small. What is the reason for the amount of nitrogen oxides to reduce? This happens because accurate regulation of oxygen provision does not create excess of it. Under such conditions, NOx is a strong oxidant, thus nitrogen gives oxygen to other agents, and recovers itself . Actually, the amount of NOx depends on the temperature. Nitrogen begins to actively oxidize at temperatures above 1300 ° C, at condition of sufficient provision of the oxygen. 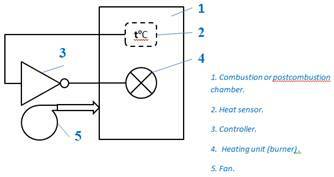 Oxygen control system does not allow creating in the postcombustion chamber such conditions, under which the nitrogen oxides appear, created earlier in the burner (fuel incineration) nitrogen oxides, subsequently reduced to nitrogen. Thus, the presence of an oxygen sensor provides not only complete incineration of organic compounds and other gasification products, but also the recovery of toxic nitrogen oxides. The amount of fly ash using the oxygen sensor is also reduced. The reason for this is obviously related to the shift of the common reaction toward oxidation. It promotes earlier slagging and sintering. A similar trend is observed with the amount of acid. Exhaust control makes it possible to lock the gasification chamber, which is especially important while disposing of highly dangerous waste, such as infected. This feature is especially useful in certain special facilities. Abandoning the controlling according to temperature provides additional advantages when burning in the gasification chamber. Forced draft does not allow a specific crust on the surface of decomposing waste to appear which, in turn, eliminates dangerous and unsafe necessity of turning the waste during the incineration process. Oxygen sensor, mounted in the exhaust system, automatically perform early diagnosis of equipment in order to avoid abnormal exploitation. 4. Bisengaliev R.A., Goldvarg T.B., Goryaev V.M. Heat recovery of supercritical conditions (SC) // Scientific electronic archive. URL: http://econf.rae.ru/article/9476 (reference date: 11.01.2016). 5. Kruse A., Dinjus E. Hot compressed water as reaction medium and reactant Properties and synthesis reactions // J. of Supercritical Fluids. - 2007. - Vol. 39. - P. 362-380.